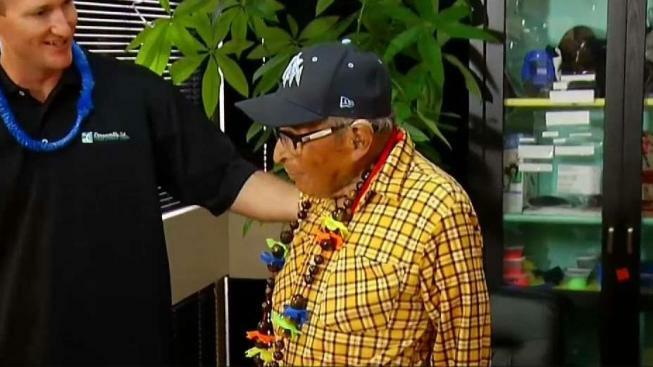 Ray Chavez, the oldest veteran survivor of the attack on Pearl Harbor, has died, his loved ones confirmed. Chavez died overnight, peacefully in his sleep, his cousin told NBC 7. He was 106. Last March, the Poway resident celebrated his 105th birthday with a solid workout at his gym. A couple of days later, a big party was held for him on the flight deck aboard the USS Midway. At that time, Chavez told NBC 7 he had hit the gym on his birthday so he could feel like he had earned himself a piece of cake. Even at 105, he was quick-witted, charismatic and humble. Chavez served missions on a minesweeper and attack transport ship 77 years ago and responded to Pearl Harbor on the morning of Dec. 7, 1941. Over the past few years, the veteran often answered questions posed by reporters about how he had made it through such a long life so happy and healthy. "Obey the laws, for one thing," Chavez once said, sternly. He also said making friends was high on his list. Chavez was also asked about what had been the best piece of life advice he had ever received. “To get as much education as you can and also to be kind to all people, especially the elderly and the less fortunate. That’s what I remember most,” he said. That advice came from his parents. Chavez recalled being called to active duty as one of the most important memories of his life. As the oldest living veteran of the attack, Chavez flew to Honolulu to celebrate the 75th anniversary of Pearl Harbor in December 2016. He was accompanied by his daughter, U.S. Navy veteran Kathleen Chavez, and escorted by San Diego firefighter Mitch Mendler and retired New York firefighter Joe Torillo, a survivor of the 9/11 attacks. In July 2015, Chavez reunited with Jim Downing, 102, in San Diego more than 74 years after they served together in the military. Together, the duo reflected on their unbreakable bond. On Wednesday, NBC 7 spoke with Chavez's daughter at the family's home in Poway, where they have lived since 1961. Kathleen said her father was an avid gardener who loved tending to rose bushes and trees on his property. She said Chavez had not wanted to reflect on his WWII experience until recently because, really, he was a bit shy. Kathleen is grateful, however, that Chavez was able to share his story in recent years. In her father's memory, Kathleen plans to go to Hawaii for an upcoming Pearl Harbor memorial. She said a date for Chavez's funeral has not been set.